Bridget has been asking me every week when Wreck-It Ralph is coming out on DVD. I tell her she has to wait a little bit longer. It comes out very soon…on March 5th! She’s super excited because of my Wreck-It Ralph voiceover that I did when I went to LA in September. 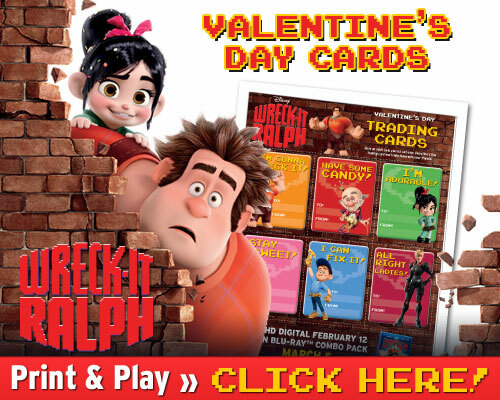 To hold her over till the release, we have these fun Wreck-It Ralph Valentine’s Day trading cards for her to bring to school. This movie was so stinkin’ cute, love the v-days cards! Those are so cute! I wish I would have bought them instead of the ones we have. I can’t wait to watch this movie with my son, I know he will love it. Thanks for posting!! Thanks so much for these! My niece will love them! Thanks so much!! These are too cute!! Too bad my kids are way over Wreck It Ralph. These would have been cute for them to make & give out. This is so cute. Thanks so much for the Valentines Day card. My grandson like Wreck it Ralph. you know how boys like to crash stuff . These are just adorable. I know my nephew would love them! These are cute and for both boys and girls its hard to find one box that can be used for both. These are cute! My son will love them.